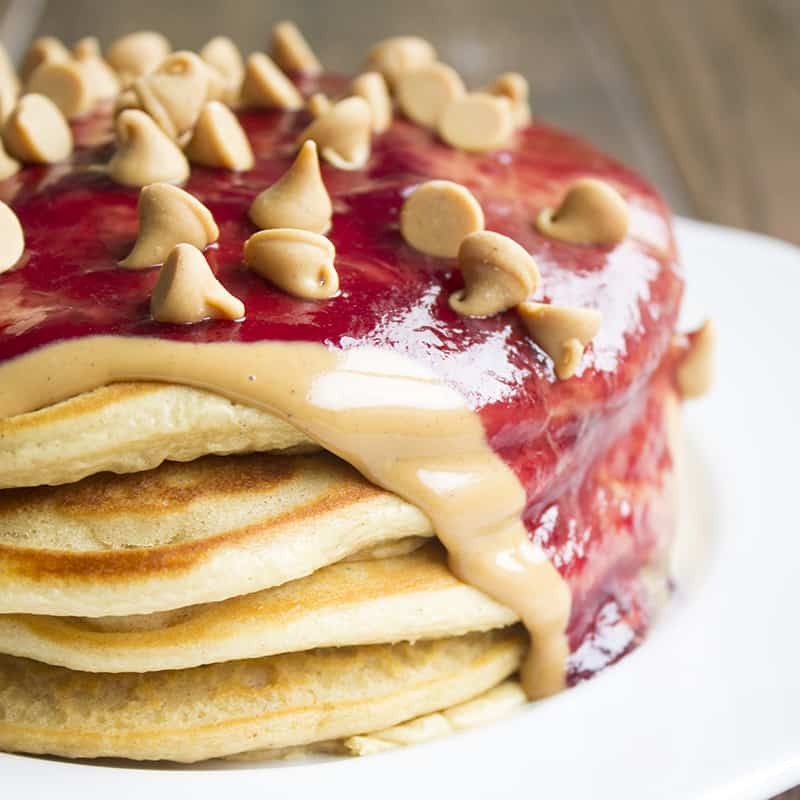 Peanut Butter & Jelly Pancakes are a delicious breakfast treat that’ll turn anyone into a kid again! They are the perfect way to start your mornings! We love love love having pancakes in the morning for breakfast. My oldest even tries to get me to make for lunch (to take to school). Growing up I remember waking up on Saturday mornings to my mom making pancakes and bacon, and I would douse it all in maple syrup. Heaven. Most days I go with our tried and true Perfectly Fluffy Pancakes, but sometimes I change it up and do something fun. 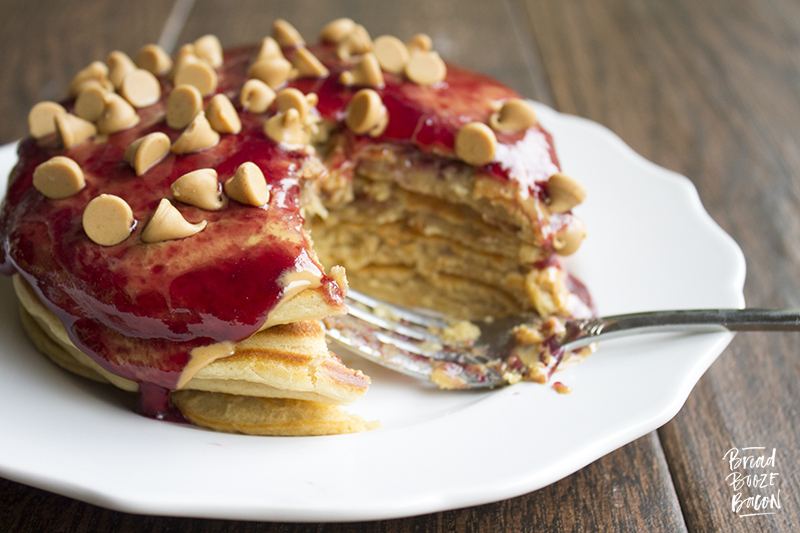 With these Peanut Butter & Jelly Pancakes I smashed together two of my kids’ favorite things to eat. Let me tell you guys, they are really good! 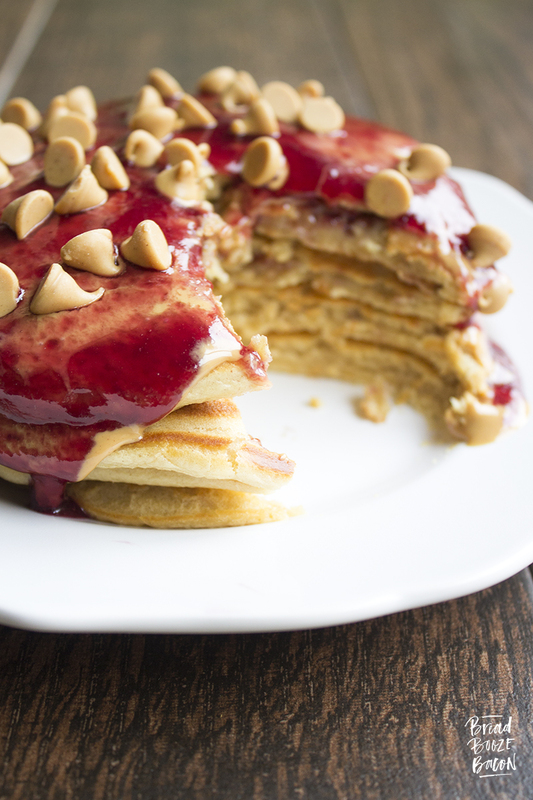 Full disclosure, the peanut butter spread on top of the pancakes is for serious peanut butter lovers. You’ll also want to have a glass of milk handy. 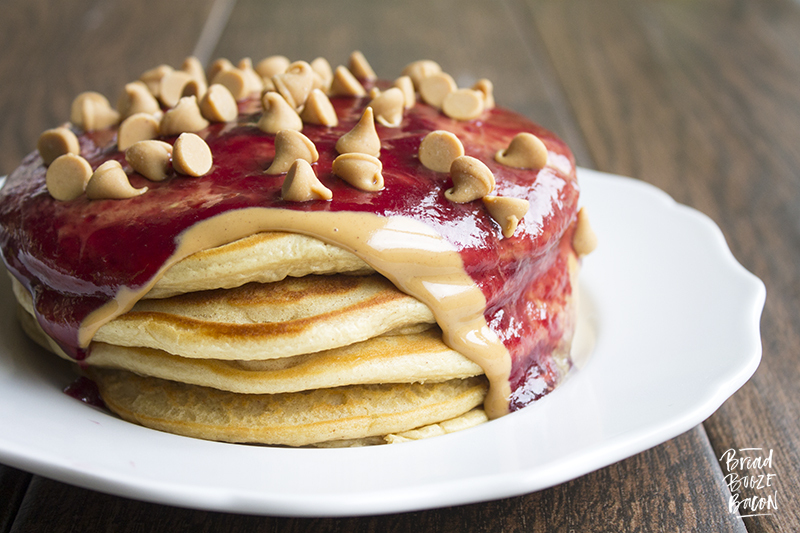 If you don’t want that much peanut butter-ness to your pancakes, leave the extra PB off. The pancakes have enough peanut butter flavor on their own. I just wanted to go all out. Which explains the peanut butter chips. If this is your first time seeing one of our 12 Bloggers posts, you are in for a good time kids. 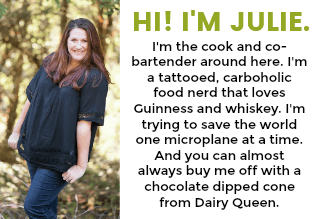 Each month on the 12th, 12 of us bloggers get together to bring you some super delicious themed recipes, all with 12 ingredients or less. We have a whole bunch of recipes from last year’s series for you to check out here. Get ready to get hungry. This month’s theme was chosen by the amazing Jamie from Love Bakes Good Cakes. Jamie’s blog is full the most delicious food! I don’t think I’ve ever found a recipe from her site I didn’t want to try. Yeah. 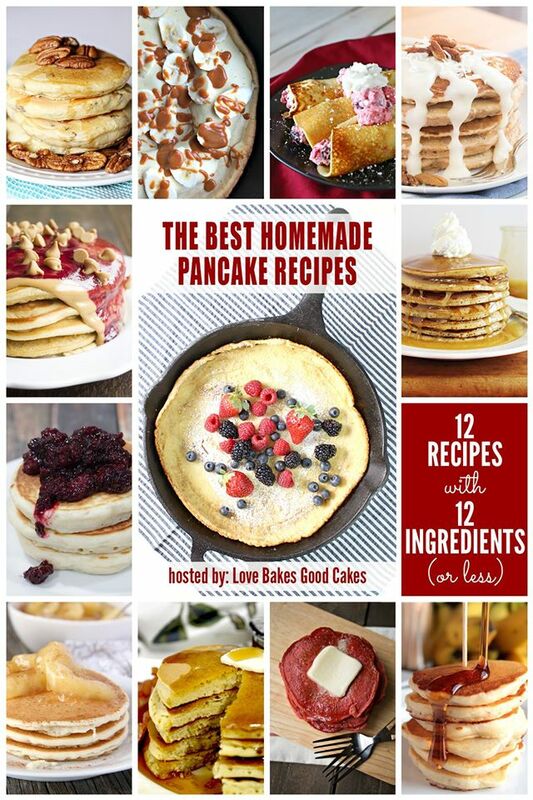 For all the pancake recipes being shared today, check out the links below. 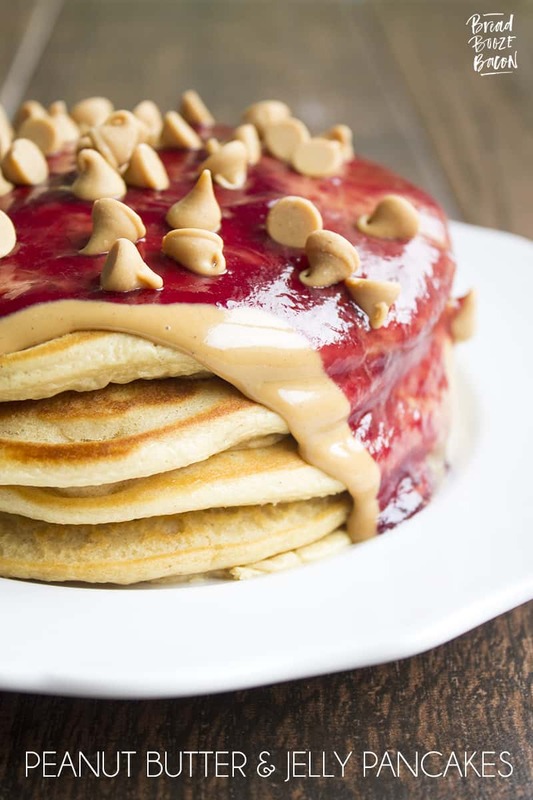 Easy Swedish Pancakes from Kleinworth & Co.
Peanut Butter & Jelly Pancakes are a delicious breakfast treat that'll turn anyone into a kid again! They are the perfect way to start your mornings! Heat a large skillet over medium to medium-high heat. In a large mixing bowl, whisk together the flour, sugar, baking powder, baking soda, and salt. Add in the egg and milk. Whisk to combine. The batter should be evenly moistened and on the thin side. Butter your skillet (or coat it with some non-stick cooking spray) and portion the pancake batter into the pan. Cook for 2 to 3 minutes, or until a couple bubbles form around the edges.Flip the pancakes and cook for another 1 to 2 minutes, or until both sides are golden brown. Transfer to cooked pancakes to a plate and repeat with the remaining batter. Add the jelly, cornstarch, and water. Once the ingredients have had a few minutes to heat up, whisk them all together until combine. Continue to cook until the syrup begins to bubble. Reduce the heat to medium-low and keep warm until the pancakes are done. Plate your pancakes. If desired, spread the top pancake with some melted peanut butter. Pour some the jelly syrup over your pancakes. Sprinkle with peanut butter chips if you'd like. To melt the peanut butter, place 1/4 to 1/2 cup peanut butter in a microwave safe bowl and heat it for 20 to 30 seconds until smooth and viscous. If the peanut butter cools down too much it won't be as runny. Just heat it up a little more, as needed. 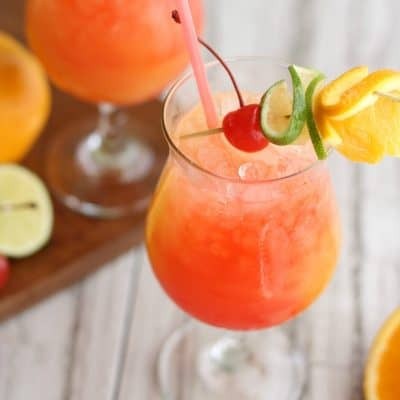 Wow, these look absolutely amazing. I will definitely be trying these out! Pinned for future reference. Thanks for sharing, stopping by from SITS!